As an executive, you're already familiar with the idea of creating standard operating procedures (SOPs). Typically, they are the necessary (and typically dull) documents that make sure things in the company keep moving when the people who are running the show aren't around. But what if SOPs could be used at the personal level, too? What if the repeatable tasks you do every day (or perhaps more frequently) could be documented so well that someone could pick up your instructions and start handling those things for you? It'd be a whole new world, right? But that's exactly what you, as an executive, need to be doing. By not having these functions handled by someone else, you're wasting your valuable time on the minutiae when you could be helping grow your company. Today, we're going to talk about why you haven't managed to offload your tasks yet, remind you of what waits for you on the other side of learning to let go of things you don't want to do anyway, and walk you through a simple guide to help you decide exactly what to pass off first. Download our FREE template SOPs for Execs and start systematizing your tasks. You probably already know you need to be handing off more of your tasks, but let's go a little deeper on why that hasn't happened yet. It's difficult for many leaders to carve out the time necessary to create the processes and systems that you and your company need when you're time-starved already. So why should you sit down and map out how you do what you do? As an example, most executives get 10-12 hours back a week when Prialto takes over their schedule and calendar management. It's a small investment right now to reap big rewards almost immediately after. You're not convinced anyone else can handle it. I wish I couldn't say, "I get it," but the reality is there are a lot of bad virtual assistants out here. Maybe you've tried this whole "delegating" thing before and were massively underwhelmed by the performance of who you were working with. That's the difference between working with a random freelancer and a managed virtual assistant service. When you work with an experienced service provider, you don't have gaps in coverage - and your crucial administrative tasks aren't dependent on the one person who knows how to do them the way you like - because you have a team at your disposal. So let's talk about why this time you are going to commit to delegating - and why it's going to work. If you're stuck in the weeds playing with scheduling tools and trying to remember to log your expenses, then you're not doing the work that matters. You do what you do for a reason - don't let fear get in the way. And be honest. Fear is a factor when it comes to moving forward and trying something new. And you know you can move past it because you have before. You owe it to yourself to making progress on your most important work, like our client, Bedly who just got some great press in Forbes. You can't afford not to have someone handling your repeatable tasks. I'm not sure what your salary is... but I'm willing to guess it's more than the average administrative assistant makes. It's simply not cost effective to have you handling your scheduling or CRM software when a capable virtual executive assistant can figure it out in a short period of time. Convinced yet? There is no better time to start delegating than right now. (Except maybe yesterday.) 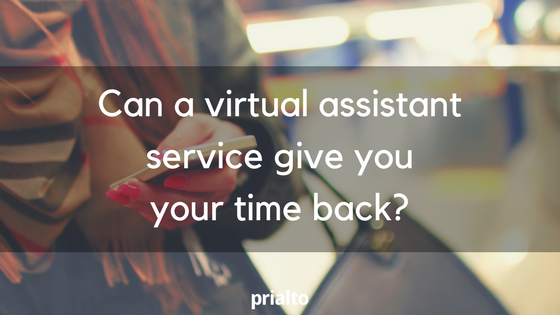 But just to make sure you have a thorough understanding of how your business can benefit from a virtual executive assistant, I've profiled a few of Prialto's Members so you can see for yourself the power of outsourcing. What happens when you do start delegating? Well, it depends. If you hire a managed virtual assistant service, these are the kind of results you can expect. VideoGenie gets their scheduling in order. Justin Nassiri is the CEO of VideoGenie, a leading social video marketing company funded by Blumberg Capital and Eric Schmidt’s Innovation Endeavors. He already uses technology tools for personal productivity, and considers himself to be fairly efficient. Justin was tired of playing scheduling ping-pong over email every day, but he didn’t really see an alternative. Prialto performed a needs analysis on how he manages his day, advising him to hand off calendar management. Today, Justin saves himself 10 hours per week by using Prialto’s scheduling solution. Josh Iverson is the founder at iMediaSalesTeam, a company that provides third-party online media sales for a portfolio of leading niche websites. Every morning, Josh’s inbox is flooded. By midday, he has at least 100 unread emails waiting for his attention, and a good number of those emails are about scheduling. Josh can’t afford to spend hours every day on email ping-pong, but he also needs to figure out what to prioritize and schedule. Today, Prialto saves Josh at least 12 hours per week on scheduling and contact management alone. Prialto’s processes also make Josh’s day more productive, thanks to our decade of experience developing best practices. If Josh is wondering when he last met someone, he can find the information in his contact’s Salesforce file instead of searching through months of calendar appointments or information on a spreadsheet. Instead, if things fall off his radar, his PA sends him a list of items that he may have missed. Prialto organizes his life and finds him more time every day. Taking the time now to dive into your needs as an executive, detail your processes, and pass them on to someone who understands the importance of your work is going to catapult you to your next level. And isn't that what we're here for? What would you do with an extra 10 hours a week? Find out today.